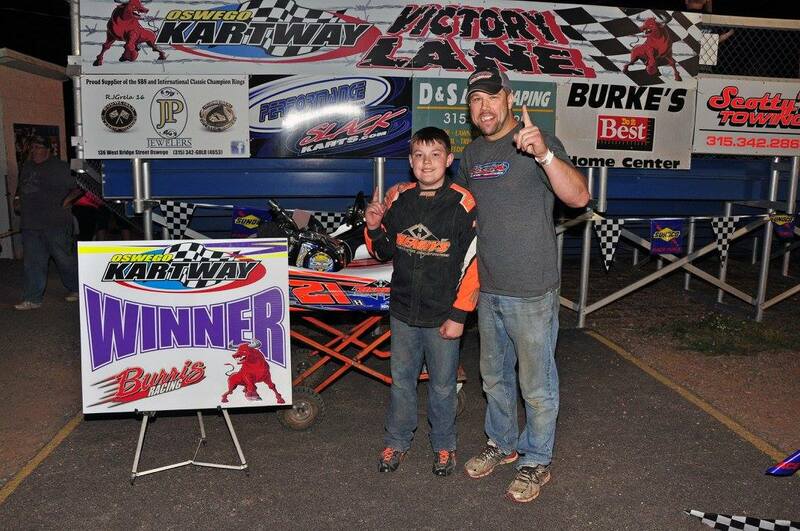 OSWEGO, NY – Yet another 120 entries took the green flag during Friday night’s Independence Weekend Grand Prix events at Oswego Kartway, with young Jake Holmes earning his first Kartway victory of the season in the No. 21H. Jake Holmes has been on a hot streak as of late – winning an NYDKS State Series event on June 25 at AMS, followed by his first win of 2016 at Oswego Kartway on July 1. Holmes, a former winner in the Jr. Purple Clone division, led the charge in Sr. Blue Clone on Friday defeating division point leader David Hackett Jr., Justin Pier, Sean Simmons and Devon Tonkin for the win. The win was Holmes’ first career triumph in the Blue division. 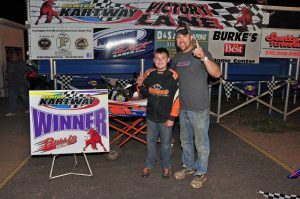 The victory for Holmes also comes on the heels of a New York Dirt Kart Series main event win at Allegany Motor Speedway on June 25. Other junior winners on Friday night at the Kartway included Tucker Fenske (Jr. Novice Clone), Emma Spaulding (Jr. Green Clone), Logan Crisafulli (Jr. Purple Clone), Jacob Hutton (Sr. Green Clone), and Griffin Miller (Jr. Blue Clone). In the senior divisions Ross Spilman continued his dominance of Clone Super Heavy, driving to his third win of the season in the No. R99. Championship rival Matt Fay finished second ahead of Jason Moll in the top three. One event after failing to qualify for the State Clone Light feature, Ricky Pritchard returned to victory lane in the No. 26 beating out Kyle Perry and Jamie Shutts. Other senior division winners included Tyler Thompson (State Clone Heavy), Eric Raponi (Clone Heavy), Zach Mooney (Stock Medium), Hunter Lawton (Clone Light), Dave Demling (Clone Medium), and Paul Fountaine (Masters). Drivers in as many as 15 different divisions of racing are expected to again turn out on July 8 for the next round of the Kartway championship trail, featuring the King of the Kartway trophy event with extra distance features. Pit gates will open for competitors beginning at 4:30 p.m.
Driver registration will close at 6:15 p.m. with the drivers’ meeting at 6:30 p.m. and hot laps to follow immediately after at approximately 6:45 p.m. Racing will start at 7:30 p.m. Entry fees for Kartway members will be set at $20 while non-member entry fees are $23. Pit passes will also be available for those not in competition for just $10. Friday night’s racing program will see heat race lineups determined by year-long handicap with feature lineups set by heat race finish. You can follow the Kartway on Twitter @OswegoKartway or like on Facebook at www.facebook.com/OswegoKartway. To speak to a Kartway representative call the Oswego Speedway box office at (315) 342-0646.